What Causes a Heroin Overdose? Heroin overdoses are serious and often result in death because the drug depresses breathing, reducing the amount of oxygen in the brain. Know the signs of a heroin overdose and call 911 in an emergency. Heroin overdose manifests in a number of different and very severe symptoms, many of which are hard to distinguish from signs that an individual is "high." "Death rattle" (choking, snoring and gurgling sounds). Losing the capacity to speak while awake. Slow, erratic or stopped breathing. With a history of heroin dependence of between 5-10 years. With polydrug use (particularly in combination with benzodiazepines and alcohol). With the overdose event taking place in the presence of other people. In the US, non-fatal and fatal overdose rates are most acute among Non-Hispanic White men and women in the Midwest aged between 18-44. Males overdose at higher rates than females. Approximately 17% of fatal heroin overdoses are new users. Approximately 17% of fatal heroin overdoses are new users. As mentioned above, other signs that someone is experiencing a heroin overdose include a history of drug abuse or co-morbid mental health issues. Not surprisingly, on of the strongest indicators is a previous history of heroin overdoses. Sadly, heroin overdoses often occur when tolerance is significantly reduced, such as after a prolonged period of abstinence. According to recent British Medical Journal, the risk of death from overdose increases 7 times in the first 14 days of completing residential heroin addiction treatment or release from prison. 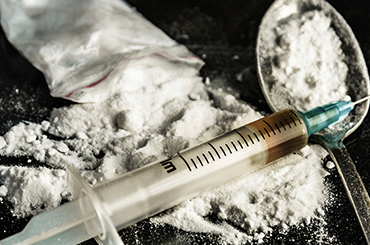 Individuals who snort, smoke or inject the amount of heroin to which they are accustomed after a period of abstinence are at high risk of overdosing. If you or someone you love is struggling with heroin addiction, please call us today at 1-888-993-3112Who Answers? to learn more about the treatment options available to you. Heroin overdose is not something that is always identifiable without medical intervention. The "death rattle" is often mistaken for snoring and overlooked as a sign of a heroin overdose. For example, the characteristic "death rattle" is often mistaken for snoring and overlooked. Heroin overdose rarely causes death immediately so the opportunity for fast responders to prevent death exists. Treatment of any type of drug overdose should not be handled without trained medical assistance. In the case of heroin overdose, call 911 or the National Poison Control Center (855-681-1324) and/or go to a hospital immediately. Try to wake up the individual. Administer Evzio (a naloxone hand-held auto injector approved by the FDA for use by family members and caregivers in emergencies). Heroin overdose is preventable. The best way to avoid a heroin overdose is to abstain from injecting or snorting heroin in the first instance. Increased treatment with naloxone or buprenorphine. Support groups like Narcotics Anonymous. Medication-assisted heroin addiction treatment is effective and provides critical recovery support for heroin overdose survivors. According to the National Institute on Drug Abuse (NIDA) however, the integrated combination of behavioral and pharmacological treatments is a more effective strategy for most people. To counteract the short and long-term neurological damage that can be caused by heroin addiction and overdose (including permanent brain damage), the use of buprenorphine and/or methadone can help to transition from an acute post-overdose stage to nascent recovery. Get Help Today Find a treatment center to help you with your heroin addiction. Heroin addiction is a chronic brain disease that demands long-term treatment. Cognitive behavioral or talk therapy. Heroin overdose is almost always accidental and due to a chronic substance use, mental health, or pain disorder (or a combination of all three) that needs long-term treatment. The emotional consequences for overdose survivors can be overwhelming. Along with the painful physical withdrawal process, anger, guilt, abashment, shame and despair are often characteristic of overdose survivors. Building a network with others in recovery from heroin addiction is critical, as are recovery support from family and friends if available. Peer-to-peer recovery support groups (such as Narcotics Anonymous). Your loved one's treatment needs are unique. Call 1-888-993-3112Who Answers? to discuss which treatment options will best help you or your loved one transition back into a sober and drug-free lifestyle. CDC. Increases in Heroin Deaths - 28 States, 2010 to 2012. Centers for Disease Control and Prevention (CDC) Morbidity and Mortality Weekly Report (MMWR). October 3, 2014 63(39);849-854. Dietze P, Jolley D, Fry CL, Bammer G & Moore D (2006) When is a Little Knowledge Dangerous? : Circumstances of recent heroin overdose and links to knowledge of overdose risk factors. Drug and Alcohol Dependence, 84, pages 223 - 230. NIDA (9.2013) Drug Facts: Heroin. National Institute of Drug Abuse, National Institutes of Health, Washington, D.C.
ONDCP (2013). Good Samaritan Overdose Response Laws: Lessons Learned from Washington State. US Office of National Drug Control Policy, The White House, Washington, D.C.
SAMHSA (8. 2014). Opioid Overdose Prevention Toolkit. Substance Abuse and Mental Health Services Administration, Rockville, Maryland. Sporer, K. BMJ. (2003) Strategies for preventing heroin overdose. Feb 22; 326(7386): 442-444.